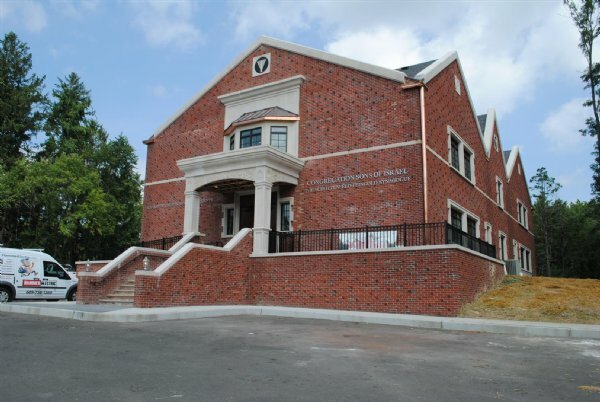 Monmouth County’s oldest shul is now also its newest. On Aug. 23, the 109-year-old Congregation Sons of Israel held a grand opening for its new $3 million, 15,000-square-foot building in Wayside, a part of Ocean Township a few miles inland from the Asbury Park home it left over 20 years ago. The festivities featured a gala dinner and an inaugural service with guest Hazan Shimmy Miller of the Young Israel of Margate attended by 180 people. Founded in Asbury Park, the congregation was forced to abandon its building in the late 1980s as the city’s Jewish community dwindled and the neighborhood declined. Carlebach said that people “were getting mugged in shul,” and evening services and activities had to be largely discontinued. Since then the 100-family congregation has been holding services, religious school, and activities in the Hillel Yeshiva across from the shul, which was founded by its members in 1952. The main synagogue will be called the Schottenfeld-Feingold Shul in honor of the New York City family who donated a substantial sum to build the structure. The family lived in Wayside many years ago and still summers in nearby Spring Lake. The synagogue will also serve as headquarters of the separately affiliated Chabad of Monmouth County, which was previously located in the school. “We’ve been holding activities in my home and at sites all over central Jersey,” said Carlebach, who leads the congregation as well as Chabad of Monmouth County. “Now we will be in one place.” The congregation is also planning to open a women’s mikva at the site this fall. After leaving Asbury Park, the congregation searched unsuccessfully for a new location for about 11 years. After encountering litigation and zoning problems, Carlebach said, he finally enlisted the help of Ocean Township’s mayor, Bill Larkin, who suggested the Poplar Place site adjacent to the school. “He said to me, ‘Rabbi, the solution is right in your own backyard,’” recalled Carlebach. With the cooperation of the yeshiva’s board and township authorities, who waived parking restrictions, the two institutions will share a parking lot, since services and activities would not be held during school hours. The new synagogue houses a 350-seat sanctuary, a social hall, chapel, classrooms, and kosher kitchen. It provides an opportunity for the congregation to grow; Carlebach predicts membership would hit more than 300 families. The congregation also has a Sunday morning bagel breakfast and a Wednesday night Torah study group that, he said, brings together people from all walks of life. Sons of Israel will hold a second official grand opening in the fall when the mikva opens, to be combined with the dedication of a new Torah scroll now being inscribed in New York. It will be completed at Hillel Yeshiva and marched with the children to the synagogue. He credited Carlebach’s determination with making the new shul a reality.